Unless you are thoroughly familiar with the nation for which you are working, the labour done on its behalf, however excellent in theory, is bound to prove faulty in practice; especially when the nation in question is one which is already well-established, and whose tastes, customs, prejudices and vices are too deeply rooted to be readily crowded out by new plantings. Rousseau had a distinctive political philosophy — but did he also have a sociology? What did he understand about how a society works? And why should we expect that a political philosopher might have something like a sociological theory of the society in which he/she lives? For that matter, what were some of the main characteristics of French and Swiss society in 1750? Rousseau’s political philosophy is well known (link). Rousseau’s conception of society in The Social Contract is grounded in a conception of the moral psychology of the individual and the constitutive relationship that exists between community and the individual. 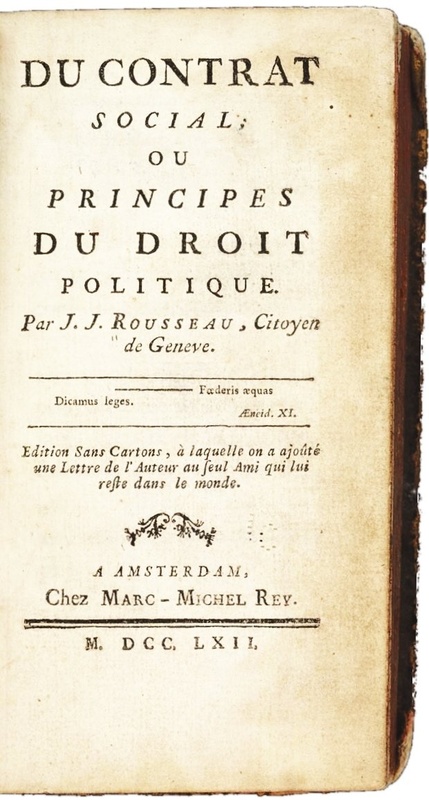 Rousseau distinguished between the natural individual (motivated by direct natural emotions and desires, along the lines of Hobbes’s conception of the individual); and the moral individual (constituted by an understanding of his relation to other moral beings). The former is outside of society; whereas the latter is integrally integrated within a set of social relationships. Rousseau is a theorist of freedom. But freedom has these same two aspects: natural freedom and moral freedom. And his conception of social relationships is simple: there is sovereignty (the relations of the polity) and there is property (the relations of the economy). What this philosophy does not provide is anything like an empirical understanding of real, concrete social life in Rousseau’s contemporary France or Switzerland: for example, the nature of the occupational segments of eighteenth-century French society, the ways in which the state exercises its power, the social practices of farming villages, or the ways in which wealth and power are accumulated by elites. There is very little concrete empirical social detail in Rousseau’s writings. So there is a political theory — a theory of different forms of the state — but not much of a theory of how social life works. There is very little social description in Rousseau’s work. The only institution he describes in any detail is the process of legislation. And there are only infrequent instances of hypotheses about social processes — how social organizations work, for example. So it is hard to avoid the conclusion that Rousseau did not have much of a sociological imagination or curiosity. Unlike Tocqueville a century later, he was not a sociologist in the making. We might expect sociological description in his A Discourse Upon the Origin and the Foundation Of The Inequality Among Mankind . But this isn’t the case. He refers to the creation of property and the consequent emergence of inequalities of wealth; but he doesn’t ask at all what the social processes are that preserve property. And there is nothing historically specific about his descriptions of property, wealth, and inequality; they remain apriori and general. What might we want from a sociology from an observer like Rousseau? We would want a couple of fundamentals: an understanding of how power works in the contemporary society; an idea of how economic institutions work; an understanding of the major classes that exist in society — and the forms of life and forms of social relations that exist within these. There is a descriptive aspect of this picture — what are the main social groups and processes? And there is a theoretical part — how do these institutions work? What are some of the causal processes that can be identified within society? Moreover, we might say that a political philosophy is seriously hampered if it is not grounded in a fairly good understanding of how society works — how individuals behave in institutional settings, how organizations work, how public opinion and shared social values influence individuals. Significantly, these are the sorts of concrete observations with which Tocqueville’s work is filled (link). We also find much more of a sociological eye in the writings of novelists. We get more of a descriptive sociology from many of the French novelists of the nineteenth century than is to be found anywhere in Rousseau. Balzac, Zola, and Stendhal all devote extensive attention to the lives and ways of the various segments of French society — bourgeois, aristocrat, peasant, merchant, thief. If the grim folklore of peasants and the violent rituals of artisans belong to a world that seems unthinkable today, we might expect to be able to think ourselves into the skin of an eighteenth-century bourgeois. The opportunity arises thanks to another document, as extraordinary in its way as Contat’s account of the cat massacre: it is a description of Montpellier written in 1768 by an anonymous but solidly middle-class citizen of the city. To be sure, the casual nonfiction of the eighteenth century was full of “descriptions,” guidebooks, almanacs, and amateur accounts of local monuments and celebrities. What set our bourgeois apart from others who dealt in the genre was his obsession with completeness. It looks like different philosophers create different blueprints of a future society. Their theoretical society is logically consistent, but practically underestimates the evolvement of interactions among human beings. Completely following their theoretical framework to build up a society is troublesome or even dangerous, just as the history of China between 1949 and 1978 has demonstrated.